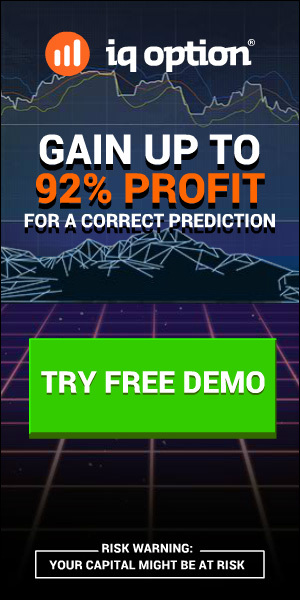 What if you could master 100 + year old time tested & proven system invented by Charles Dow himself…With a modern twist so powerful it can transform you into a top level trader in under 30 days. Most trading methodologies use “time-related” indicators that lag behind the market. These indicators can cause even experienced traders to jump into “false moves” and chase sideways markets. But what if there was a trading strategy that wasn’t based on TIME, and instead focused solely on PRICE (the only indicator that DOESN’T LAG) and the movement of the markets? Fortunately there is, and it’s called Point & Figure! 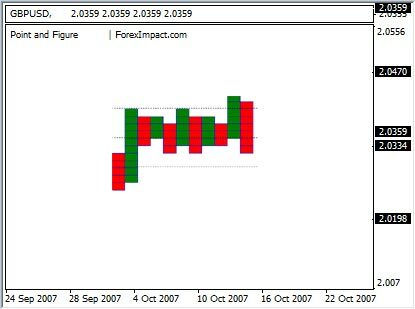 “Point & Figure” (P&F) is a charting method that follows changes in prices rather than time. Most charting systems (including candlesticks, line charts and bar charts) track values based on specific timeframes, so you can look at how values change over the course of minutes, hours, days, weeks, etc. Point & Figure charts are very different, however, in that any column can represent any amount of time. In fact, time is completely irrelevant! If the price of the security, commodity or currency doesn’t change, then no new markings appear on the chart. If you think about it, isn’t time a somewhat arbitrary way to track market movement? Last I checked, we as traders only make money when PRICES move. The fact that an hour, day or even week has gone by is irrelevant. The only thing that matters is PRICE MOVEMENT. Part of the original appeal of the point & figure method was that it made it easy for traders (before the age of computers) to maintain a large collection of data without becoming overwhelmed. Since point & figure charts only tracked the major movements rather than specific closing prices at specific times, data could be condensed into much more manageable sizes. Just try to imagine what it would be like to track even one stock on a minute or even 30-minute basis before computers. It would be almost impossible! But by filtering out the insignificant moves, traders could now analyze over 50 charts in a day with just a few pages of graph paper and a pencil! And as a side benefit, the picks they made were actually MORE ACCURATE and MORE PROFITABLE because they weren’t distracted by the “false reversals” or enticed to jump into “sideways markets”. Thanks to the beauty and simplicity of the Point & Figure system, all this “noise” was filtered out automatically! Yes, believe it or not these charts are reflecting the exact same time period for the exact same currency pair, but as you can see the Point & Figure chart has significantly less data. That’s because there is no set amount of time for each “box”. If nothing major happens on a trading day (which was the case in the example above), then Point & Figure charting filters out the “noise” and only records the larger moves. Also, once you understand the sixteen (16) Point & Figure box patterns (and don’t worry…I’ll teach you what they are), you’ll be able to tell at a glance that this is NOT a time you would want to be trading. On the standard candlestick chart, however, this is far less clear, which could lead even experienced traders to chase false breakouts and reversals. I’ll discuss the “boxes” and “patterns” in greater depth later on in this report, but for now just know that they only appear when the price moves a pre-determined amount. 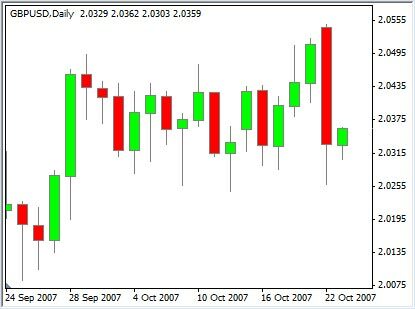 If the value of the currency pair doesn’t change (or if it only changes a very small amount), no new markings, or “noise” appears on the chart like they would with other charting methods. The chart only follows price patterns which is one of the few indicators that DOES NOT lag. This means you get to base your trading decisions on what the market is doing RIGHT NOW, not what it did in the past. Now don’t get me wrong…I’m not saying that lagging indicators can’t also be incredibly helpful, but when compared to actual price movement there’s really no comparison. 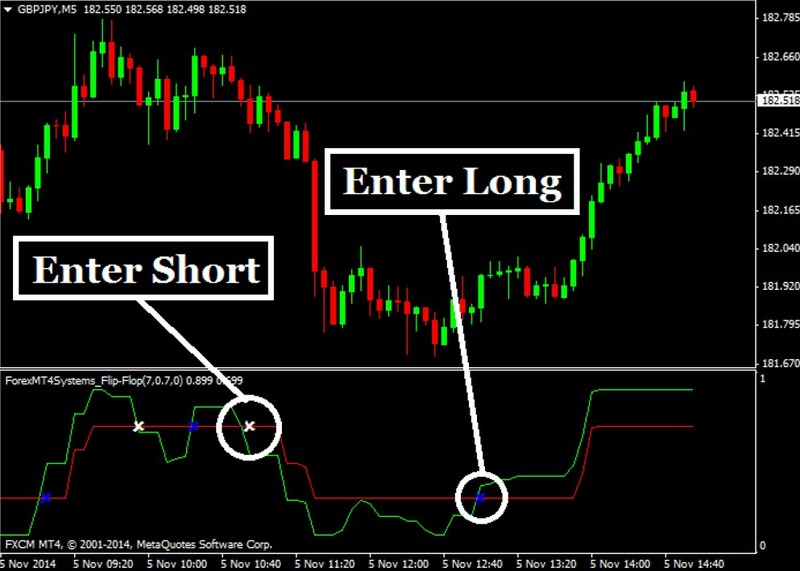 This makes trading extremely easy since the chart’s rules are simple, which means even novice traders can learn very quickly when they should buy and when they should sell. In fact, it’s probably one of the least complex systems out there, which is part of the reason it’s so effective…and profitable! In my opinion, these 16 trading pattern blueprints are as close to the “Holy Grail” of trading the Forex markets as you can get. Why do I say that? Because they contain every single pattern you need to know to trade this methodology! 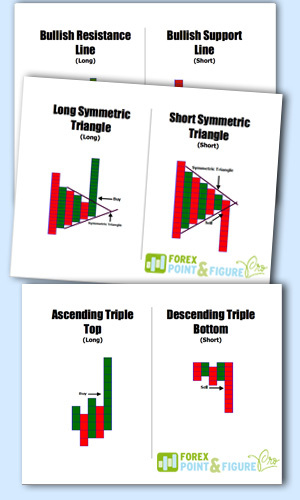 After you are comfortable with the material taught, you’ll want to refer to these blueprints again and again until the trading patterns are fused into your brain. But don’t fret! You can begin trading even before you learn them, as we have actually automated the entire process for you… so you can start trading right away! Also included is a Trade Position Blueprint that helps you figure out how much to risk per trade, along with a simple way to keep track of the key numbers you’ll use during each trade you place. Does this $14.50 package provide you with an indicator that plots just the basic PNF charts, without S&R breakout lines and alerts?